Another awesome post!!! Thanks for always starting my day off with thought provoking inspiring words of wisdom. Thanks, Kathy– and yes– we are enjoying our time significantly! Thank you for another inspiring post!! I think what I love most about your blog is that it’s not “preachy” and can/does apply to any and all faiths, religions, etc. I believe your blog can help those who are pretty certain in their faith but need or want to examine it more thoughtfully, and those who have no idea what they believe. Thank you!! Thank you Sara. I personally don’t like to be “preached” at (unless I’m in church- and then I like to be challenged, not condemned!) I pray that everyone who reads this post will understand the blessing and magnitude of what Jesus Christ did for us when He came to earth, died on that cross and rose again! 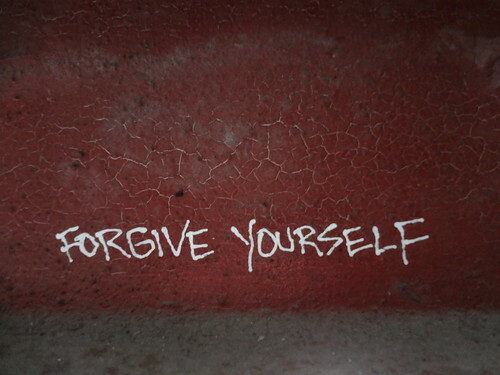 Forgiving ourselves is so important and yet something that so many struggle with. Thank you for this post! Sharita, thank you for stopping by my blog. I find that forgiveness of oneself is one of the hardest things for Christians to accept, especially for those of us who came into the faith after having “lived” a bit in the world, if you know what I mean. Or when we make monumental mistakes after having met Christ. The Bible tells us He remembers our sins no more, yet we insist on reminding him of them. Why is that?!! Great words, Gaby– we are so hard on ourselves– it just gets out of hand sometimes. We really do have to let go and let God do his thang! This is exactly what I needed to hear tonight. Thank you (and Jesus) for your perfect timing of words. I hope your mom made it safely and that she gave you the hug I sent. It was filled with happiness and excitement and sympathy and missingyouness…mostly missingyouness. See you this summer. She did make it and I have felt all of those feelings– can’t wait to see you my friend. Love you lots. Instructions for readers of this post: Read closely. Pray. Repeat. Read closely. Pray. Repeat. Daily, if necessary. Powerful truths shared here. I thank you for this gift. You are so incredibly welcome– and I love the “instructions” for this… A great reminder for me too!! Great post! Yes the cross has all our sins covered – past, present, and future. Thank you, Joan! So overwhelmed at the Power of the Cross.